When I think of autumn I think of new beginnings, new possibilities and most of all new fashion. Its honestly my favourite time of year as the weather is still warm where the sun has shone on us all summer long and the autumn winter fashion trends are flooding the high street. It takes me a few weeks to figure out the looks I want to channel but I’m the kinda girl who goes with my gut and if something jumps out at me I find a way to make it work. Stella is know for her ethical fashion & now being an advocate for her first ethical store in London a store with the cleanest filtered air. Now let’s get real, I have a flat to furnish this winter so I can’t really be spending large amounts on clothes but on this particular visit the sales associate was so damn good I think I would of brought the whole store if id had the funds. Anyway the shorts were on sale half price BONUS and I thought with my tan from holiday I should show my pins off until winter really hits and i’m knee deep in fluffy socks. Now that i’ve bigged up Stella above about how good it is to be an ambassador for ethical fashion I can write this about the reality of wearing these shorts…. They are so uncomfortable! Not only does the suedette inside leave burgundy die all over your bum (yes i’m a thong girl) the inside of the seam on the shorts also rubs on your inner leg making you walk like your inner thighs are chaffing after a summer heat!! So Stella I will be bringing them back to your Bond street store this week and hoping for some kind of exchange as yes there cool but boy are they a pain to wear. 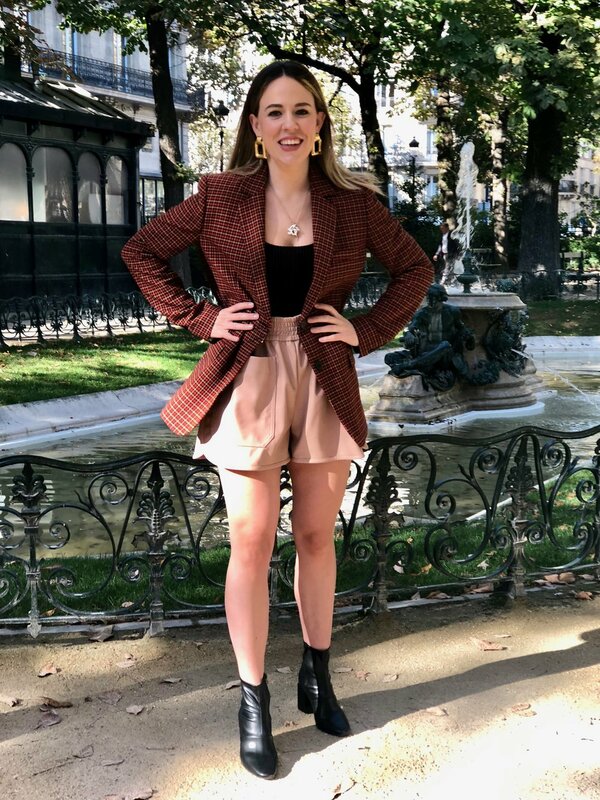 This oversized suit jacket is prob my fave item of this look, I was a tad unsure when I picked it up in Zara as my first impression was ‘paddington bear’ but once I had it on my back I was sold. I’m a big fan of the suit jacket especially when it looks like you stool it from your boyfriend. I’ve heard ‘& other stories’ underwear was good so headed in there to hunt for a simple body to layer under the suit jacket. Thats when I spotted this 90s square neck velvet body and knew It would be an item i’d wear with many other looks in the future. One thing i’ve learnt from starting my blog is to not over buy and end up with a wardrobe full of outfits which you’ll only wear once. When ever i’m out thinking about my looks the first thing that pops to my mind is ‘am i gonna wear this again’ if the answers no its gone. M&S I am lovin your footwear lately. 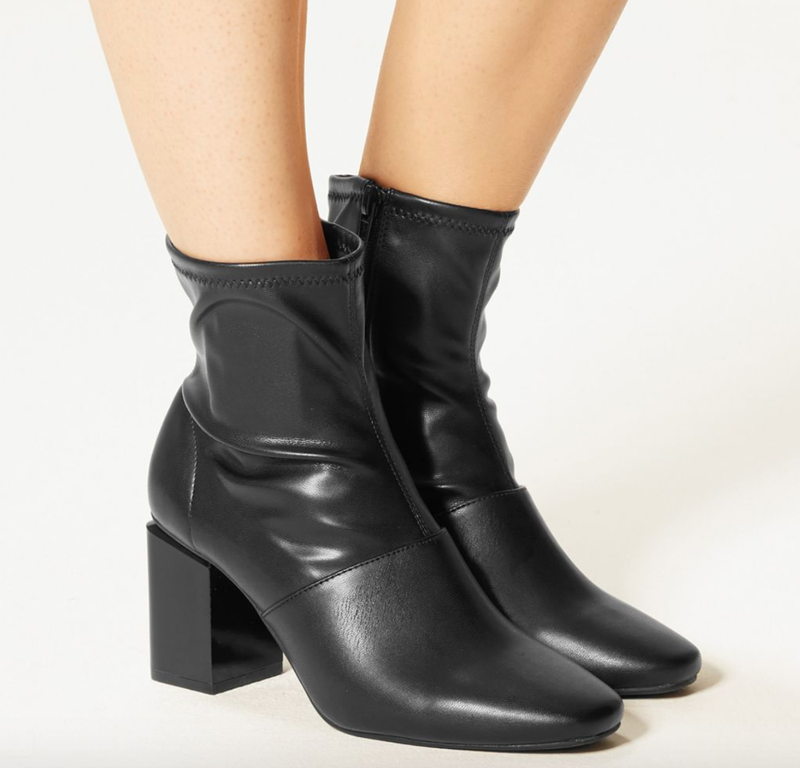 I picked up these skin tight ankle boots in Westfield which are so flattering as they mould to feet and man there comfortable (can you tell I’m all about comfortable fashion these days). These boots are a slight copy of the Celine ones so if your looking for a designer copy, grab these before they go. 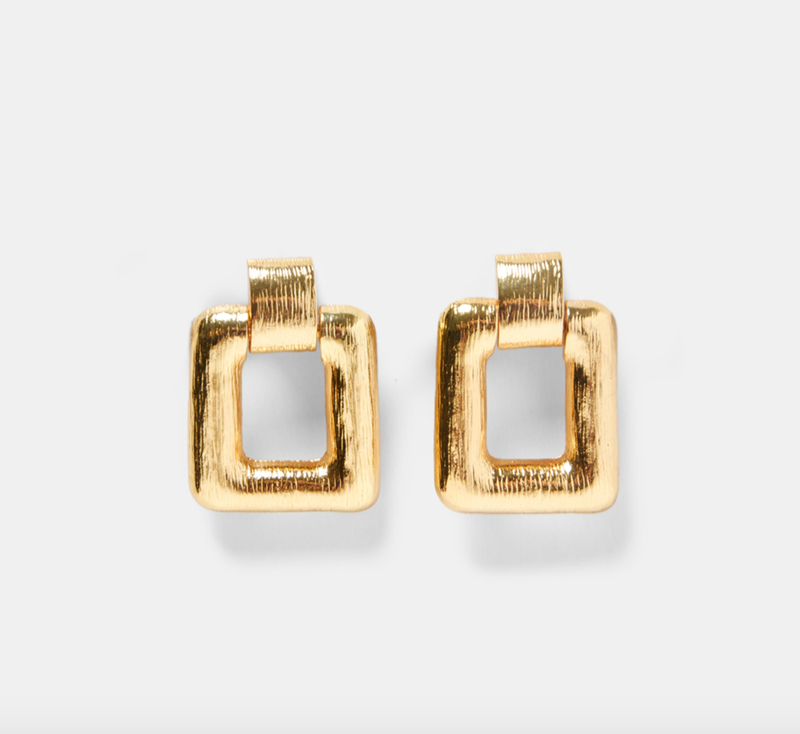 If you’ve not clocked into this trend well you must of been living under a rock as the earring is the only real piece of jewellery you should be rocking right now. Large, very oversized in fact, gold but more likely to be brass and shaped like an ornament which you’d spot in a Versace’s catwalk show is how you want to play this. I love these ones I’m wearing as they look like a brooch but also have that pretty women vibe and also that 90s super model look which is a vibe I often reference. NOTE :: They can’t be worn all day as most of them weigh a tone so limit your wear-age to a few hours or you’ll need to bath your ears upon for hours after use! 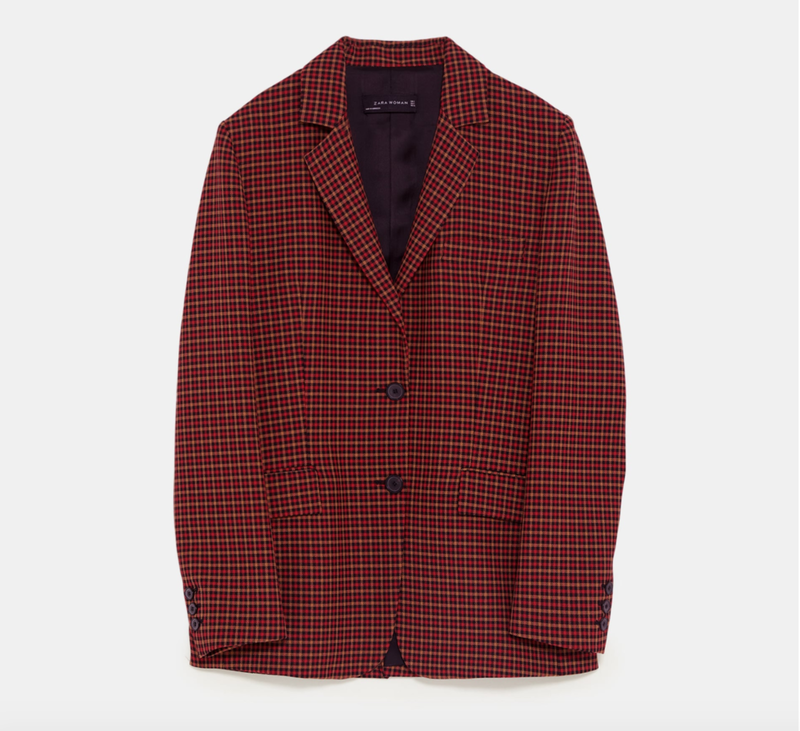 This look combines many items i’ll wear alongside other looks in the future as the aim of the game is to buy smart these days by buying items you’ll wear again and again. So lets ‘start as we mean to go on’ this season and make sure the pieces we’re buying won’t end up in the ‘what was I thinking’ bucket!